Log in and click My Account at the top of the screen. The My Account page will open. 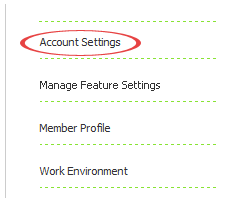 Click Account Settings from the menu on the left. Select the checkbox to subscribe to the Weekly Calendar Summary emails or deselect to unsubscribe. You may also unsubscribe from a link provided at the bottom of each weekly email.